OMG, a major victory in the home of the men-children – one of the boys has voluntary cleaned his bedroom. The reason for my excitement – it’s actually the man-child who was content living with crap from one end of his room to the other, carpet no longer visible beneath the growing pile of clothing, bags, shoes, papers, beer boxes etc. 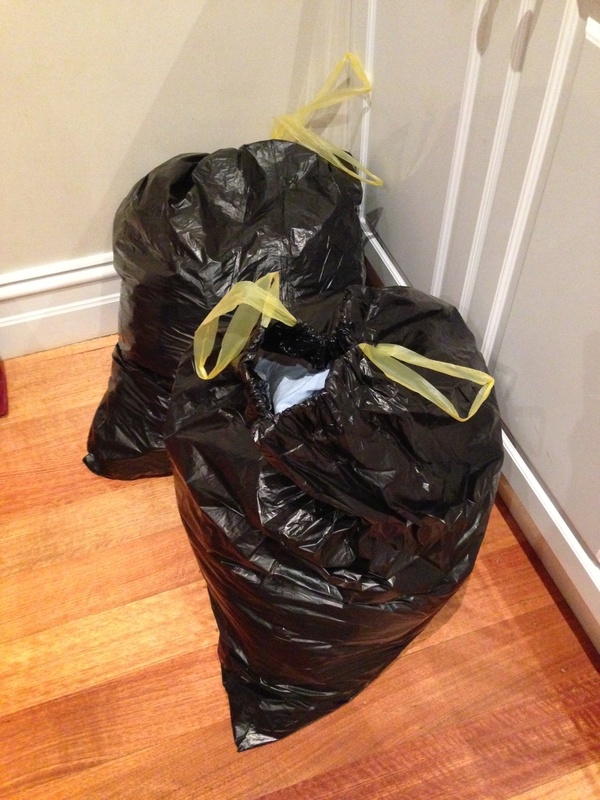 I came home last night to find two full garbage bags sitting in the family room. Naturally I enquired of Father of a Man-Child about the contents, sure they were yet more bags of donated footy boots that would live in our house for another four months. You can imagine my surprise when he told me it was the clothing that our man-child had sorted in his bedroom and decided he no longer needed. I was temporarily dumb-struck at the news, before sheer excitement overtook me. I asked for a celebratory drink, and raced upstairs to see the impact of the purging. The fact that one can now actually see the carpet in man-child’s room is excitement enough. He has removed the largest piles of offending items, and begun the process. Before you get too excited, it’s not quite spotless yet (he has the high standards of a neat freak to live up to remember) but he’s made a great start. The cupboards have had a good clean out, his clothes now have a place to live, and he even has a bag full of items he intends to sell. I asked if he was going to continue with the clean-up project, grateful he said yes, albeit “eventually” (let’s not overdo it on the first day). But just to have agreement that he will tackle his desk in due course, and also remove and/or sort out all the bags, scooter, gym weights etc on the floor of his room is cause for further celebration. Now you may ask what led to this change of heart? I certainly have. Father of a Man-Child thinks it just takes a while for the message to sink in, so perhaps it has been delivered often enough that it finally took hold (definitely a possibility). In my most recent letter to them following WWIII in our home, I did describe his room as positively “vile”. Man-Child was also recently the recipient of two wonderful pieces of memorabilia for his room – a framed football jumper and a framed collection of his rowing photos and medals, which I think he realises, will look great in his bedroom if it’s clean. In its current state you wouldn’t even notice the frames. Of course he only has to look at this brother’s bedroom to see the idyllic state his room could be in – perhaps that finally inspired him also? So, a small victory for Mr and Mrs Tidy Town (that’s us), and a major leap forward for our Man-Child. I will gently encourage him to continue the clean up (don’t rush me Mum), and maybe even offer to help (who knows what I might find though).